As the heart of our aircraft, we builders spend much time considering our engine choice. Once that choice is made, then we have maintenance and operation to consider. 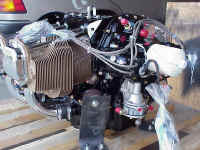 This page chronicles my engine choice and several operation and maintenance topics. This is my O-360 A1A which was custom built by Bart Lalonde at Aero Sport Power in Kamloops, BC. Bart is developing a great reputation in the experimental aircraft community. 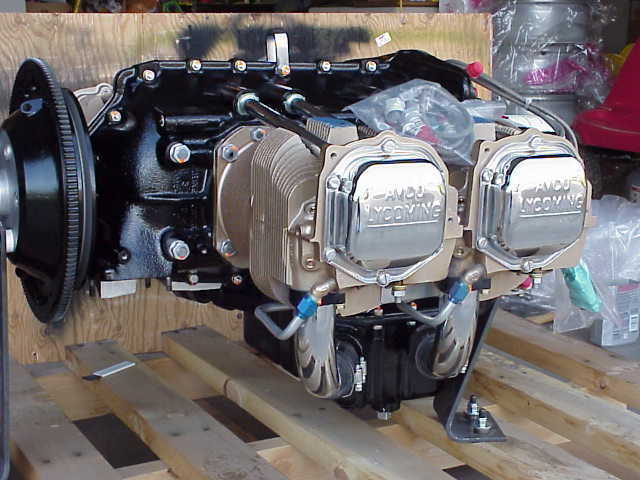 Just check around among RV builders, there's a lot of happy builders with these engines. 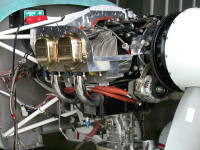 Van's Aircraft has an Aero Sport Power engine in the RV-9A demo plane and more than one Van's employees are using them. Each engine is specially built to your specifications. I ordered mine with Unison LASAR ignition, slightly higher compression (9.2-1) pistons, a spin-on oil filter mount, and a bit of chrome to dress it up. Bart indicates it should produce 190-195 hp. He test runs every engine for an hour but unfortunately doesn't have a dyno to document the exact power output. He will paint it to your color specs at no extra charge and uses PPG Concept acrylic urethane for a very durable finish. Here it sits on the skid waiting patiently for me to mount it. 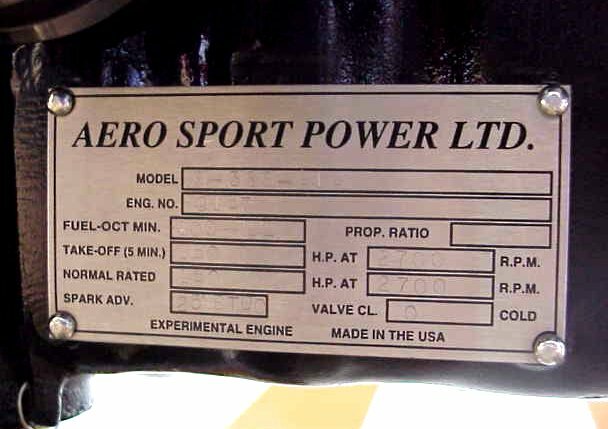 Technically this engine is not a Lycoming as you can see from the data plate. It's also not certificated which makes it suitable for use only in an experimental category aircraft, which my plane will be. This saves money on certification procedures. It sure looks better here than sitting on the floor - my engine takes it's rightful place on the front of the plane. Now the long installation journey begins. I'm using the Vetterman exhaust system: it fits perfectly and looks very well made. Installation took maybe 45 minutes. The bolt and washer configuration is confusing but the diagram Van's provides in the manual explains it thoroughly. Although this question pertains to my RV-8 I believe the principal would apply to all RVs, so here goes. About six months ago at a local builder's group meeting at my house Bill Benedict was showing another builder how the top of the engine should be level with the main longerons. He had someone raise the tail and shim it so as to level the fuse as measured with a bubble level on the cockpit sides (longerons). He then put the bubble level on the engine to demonstrate this. He indicated you could measure it longitudinally on the tops of the valve covers, tops of the head castings, or the pushrod tubes. Using the bubble level on all three showed the same results. Turns out my engine was not exactly level with the longerons, but rather tilted up a bit. My buddy's SmartLevel was not there at the time so I do not know the precise difference in degrees. I've been thinking about this in the months since wondering whether to worry about it or not. The prop (constant speed) was not mounted at the time and there was some speculation that that weight would bring it down. I am now about to mount my cowl and will need to either address it or not. After doing some preliminary cutting last night on the cowl top half it does appear that the rear of the spinner is not parallel with the face of the cowl, but of course this could be a problem with the cowl (Sam James) as well. No where in the manual or the plans is there any mention of checking that the engine, and thus horizontal thrust line, is level. I could make a small adjustment here by moving some washers in the upper engine mount thus tilting the engine down slightly, but I have never heard any mention on the list of anyone doing this. I have no idea how much that would change things. So here's the question: what does anyone know about this, and should it be addressed (removing my baffling etc. to get to the right hand nut!)? If you remember the question I posted regarding my engine thrust angle relative to the main longeron level then you might be interested in what I learned and did. To refresh your memory, Bill Benedict spotted the fact that my engine was not level with my main longerons, which it in theory is supposed to be. We couldn't quantify it at the time because we only had a bubble level. Well, Monday night I borrowed my buddy's SmartLevel (man what a useful device!) again (I used it for mounting wings and empennage which I highly recommend) and measured everything. 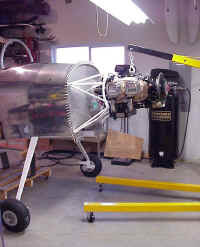 With the fuselage completely leveled out, both laterally and longitudinally, the engine had .5 degrees of positive thrust angle (tilted up at the front), and this is with the prop and spinner mounted. I used a straight edge pivoted at the engine mount and the SmartLevel to determine what that was in vertical inches at the back of the spinner... it was 1/4-9/32". Most people with O-360s (parallel valve) and c/s props are reporting about 3/16" sag after 50 hours or so, therefore I would still be left with a small bit of positive thrust angle (maybe a tenth of a degree) once it sagged. Hmmm. I called Van's Monday and talked to Tom Green. We agreed that I'd quantify things and call him back today with the measurements referenced above. Tom referred me to Ken Krueger in the engineering department. I had a great conversation with Ken and learned many things. Did you know that the RV-3/4/8 all are spec'd with 1/2 degree positive angle of incidence on the main wing, while the RV-6/9s use one full degree? The thinking is that the RV-6 would be more of a cross country aircraft carrying more weight and flying at higher altitudes, therefore they gave it the extra half degree to support the weight and keep the tail from sagging at cruise. Remember also that in theory these planes cruise most efficiently when the longerons truly are level in flight, which according to Bill's informal research most RVs do not. Because of this, and after thinking about it all day, I decided to put a washer in between the motor mount and the engine boss on the top mount to eliminate the positive thrust angle. Ken was fairly neutral on the issue and said that indeed it may add a bit of efficiency, but the difference would be small. Well, if it is going to be addressed it needs to be now before I mount my cowl, so tonight we jacked up the engine and put the washers in. (note that the plans call for TWO small washers under the nut, so just leave one off which compensates for the added thickness of the large washer). After getting everything perfectly level again the SmartLevel can't make up it's mind between 0.0 and +0.1 degrees of thrust angle. Yahoo, now if I end up getting 3/16" sag this should translate into about negative .1-.2 degree thrust angle. This is undoubtedly splitting very very small hairs, but this should optimize the thrust angle and keep it from cruising tail low, especially with Bubba in the back seat. In the final analysis I do not recommend that other builders worry about this. If you think about it an O-320 with a wood prop will only sag 1/8-1/4" and will end up with a small positive thrust angle. Yet those IO-360 with c/s prop installs will sag the most at maybe 1/4-9/32" and end up at zero. They will all fly fine, but I at least feel better knowing that my thrust angle is as close to zero as is possible, undoubtedly a product of my compulsive nature. Also, this way if it sags more than anticipated I can remove the washers fairly easily later. Just think, now when I'm cruising along at 201 mph I can fool myself into thinking that that extra mph came from inserting the washer! "LASAR®, which stands for Limited Authority Spark Advance Regulator, is the first microprocessor-based engine control system approved by the FAA for General Aviation piston aircraft. LASAR® differs from the full authority digital engine controls, often called FADECs, used on turbine engine aircraft in that LASAR® has inherent mechanical magneto backup systems that automatically assume control if electrical power is interrupted or if the microprocessor detects a system fault." Being familiar with the benefits of electronic ignition systems on cars it seemed a shame not to take advantage of this technology on my plane. Why LASAR? I liked the fact that it's certified, I didn't like the idea of plugs firing at different times as would be the case when using one of the two other alternatives (could have some negative impact on combustion flame propagation), had I had heard from other pilots that factory support was excellent. According to the manual, LASAR works with bus voltage down to 7 volts. A typical 12v bus goes to 9.7 during cranking, so you could have a fairly seriously depleted battery and still have LASAR work. You can hand prop an engine with LASAR. In fact since it enhances starting it is actually easier to hand prop since it automatically retards timing and provides a hotter spark, though I don't recommend it. My buddy personally hand propped my plane one time when I had a starter problem so I know this is true. LASAR will raise CHTs 10 degrees and lower EGTs 20 degrees exactly as predicted. This is because it is burning more of the fuel/air charge in the cylinder thus generating more power. I have verified this by turning the LASAR off and letting the temps settle out for ten minutes. When you turn it off you can definitely feel that extra smoothness go away. LASAR is available both with a CHT sensor circuit and without. This circuit monitors CHT and automatically begins retarding the timing as the temperature goes over a fixed point, I believe it is 450 degrees. This circuit was required for FAA approval on several airframes. Experimental aircraft builders do not need to have this circuit unless they want it. Be advised that it requires a special dual tailed CHT sensor that will be different from your other sensors. So as to use exactly the same sensors in all cylinders I opted to not use the CHT circuit, but you must specify which way you want it when ordering it. The LASAR brain has an RS232 output so you can read what it's doing on your laptop computer. I haven't tried this yet but plan to. Lastly, my experience with Unison's tech support has been fabulous. Harry Fenton manages this function and he is very knowledgeable about the product, fairly responsive, and is experimental-aircraft-friendly. “What, you’re installing new cylinders on a brand new engine?” was the question asked by all who heard I was indeed tearing things apart for a complete cylinder replacement. Some background: I took delivery of my engine in April of ‘99. 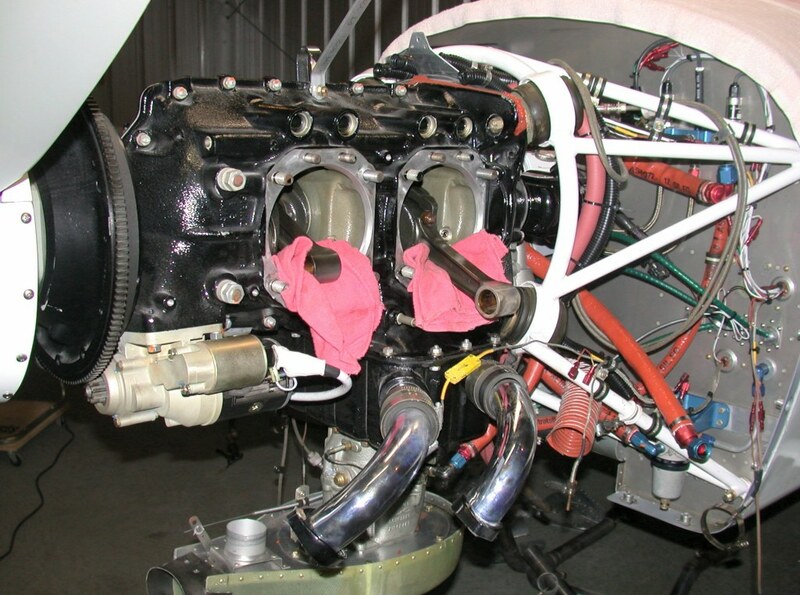 At that time I opted for first-run rebuilt Lycoming cylinders. I did this to save some money and also figured that I’d have them off at mid-TBO anyway. 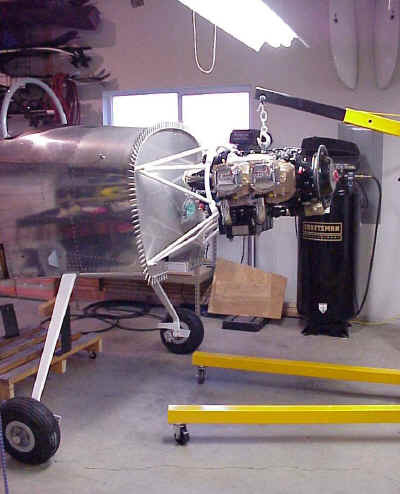 In the next couple of years as I finished the plane I sort of regretted this decision and wished I had paid the extra money for new cylinders. Oh well, I wouldn’t have to worry about for a thousand hours or so anyway. April of this year brought the first start of the engine followed soon by the first flight and everything that brings with it. During the critical first few flight hours I did my best to follow proper engine break-in procedure: try to hold high power settings and high manifold pressures and watch CHTs and oil temps. That is easier said than done. I had probably the normal array of new airplane bugs to deal with, as well as trying to get familiar with the flight characteristics of a new airplane, and gather test data as well. To those who haven’t flown yet: there is an almost overwhelming number of things to try to accomplish in your first few flight hours. So did I break the engine in properly during this critical period? I reviewed the oil consumption record you sent in. I don't think it is going to get any better. I suggest that we prep up 4 more cylinder kits and we replace the existing cylinders. If the engine is running good right now we could wait till your good flying weather is over. Think about this and let me know what works for you. I then phoned Bart to fess up that I may well have not followed the break-in procedure perfectly with everything else I was trying to accomplish during those early flight hours. Didn’t matter, Bart was quite willing to swap cylinders out regardless. Wow, now that’s support! Since we were swapping cylinders on warranty I asked Bart if I could upgrade and just pay the difference, “sure, no problem”. After some consultation I decided on brand new Superior sand cast cylinder assemblies, which he promptly shipped after checking port flow and the piston balance as he does with all his engines. He included all gaskets and an assortment of pushrods so I could set the valve lash properly. 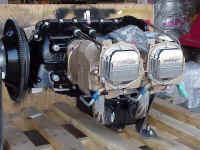 Total cost was $300 per cylinder, the difference in price originally, plus shipping. One note: if I had been willing to fly the plane up there he would have done the cylinder swap for me. But due to the weather, not wanting to get stuck in Kamloops, and wanting to learn this procedure for myself and at my own pace, I opted to do it myself. I checked the compression before removing the old jugs: 79/79/78/79, no problem there. On removing the old pistons I did notice blowby staining on two of the piston skirts while the other two were completely unstained below the bottom ring. I inspected the cylinder walls for glazing but couldn’t draw any conclusions since I’m not that familiar with what abnormal glazing would look like in an aircraft engine. The month of October was consumed with the cylinder replacement, and of course I took the opportunity to make some other minor fwf changes include a cabin heat system re-design. 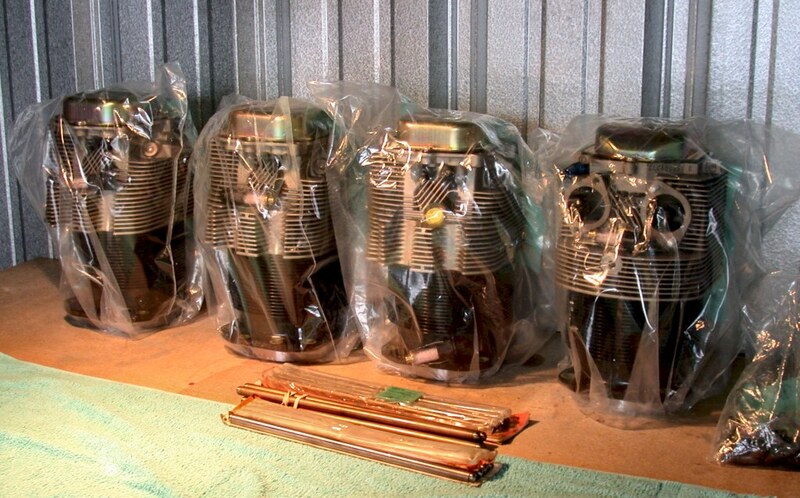 I followed the cylinder replacement procedure in the Lycoming Operators Manual, Section 5-7 thru 5-12, which I found to be clear and well written. Since I had some oil seepage of the cylinder bases on the old jugs I made a point of being very careful when re-installing the cylinder base gaskets. At Bart’s instruction I put them in place and then eliminated any twisting, and also packed them in Dow DC-4 to keep them in place and let them slide into place without binding. What caused the high-oil consumption? Did I cause this by not running the engine hard enough during the early hours? Bart took a look at them after I sent them back and reported that he did find glazing "consistent with low power operation, high temperatures, or some combination of both". I can assure you that that won’t happen this time around. This time around you can bet I paid special attention to the break-in procedure. The engine was ground run for only eight minutes once the cylinders were installed: three minutes without the cowl to check operation and for leaks, then another five for taxi and run-up prior to takeoff. It was then run at full throttle and at 1,000' msl (forced by local weather) the entire duration of the one hour first flight, of course while watching temps carefully. This regimen was repeated until 10 hours, and even in the next 10 I used higher cruise power settings than I otherwise would. If it’s possible, the engine is now even smoother — probably psychological. As of this writing I have over 50 hours on the new Superior cylinders having changed oil per the above table. Oil consumption was 1 quart in 6 hours up through about 35 hours, then it all of a sudden went down to a quart every 15 hours. Note that this is well after I had switched to AD oil from the mineral oil. I'm hoping it stays right there and will continue to monitor it closely. Run your engine at full power for the first 10 hours, with the first 2 being the most critical. If you're buying an engine from a builder for your unflown plane, consider paying them extra to take it through at least a five hour break-in regimen on their test stand. This did not occur to me at the time or I would have gladly paid them for this service. Note that this should include several sessions where the engine is run and allowed to cool to provide heat cycles.